Reverence is respect mingled with love, usually directed towards God. Reverence is also directed towards His Son, Jesus Christ. Feelings of reverence are typically manifest in one’s words and actions concerning the object of reverence. Marion G. Romney, former member of the First Presidency of The Church of Jesus Christ of Latter-day Saints, defined reverence as “profound respect mingled with love and devotion.” He went on to say that this profound respect, love and devotion “takes on the quality of worshipful adoration” when “we speak of reverence with respect to God” . Reverence can be defined as both an attitude and a set of actions. Because of this feeling, individuals exhibit reverent behavior in certain contexts. Reverent behavior can be seen when individuals visit holy places, such as temples or churches, or when they speak about religious things. In The Church of Jesus Christ, reverence for God pervades all actions and attitudes. President Romney stated: “One who has profound reverence for the Lord loves him, trusts in him, prays to him, relies upon him, and is inspired by him” . Members practice reverence as they pray to and trust God. Latter-day Saints also show reverence for Jesus Christ, his life, and mission. Though Latter-day Saints do not worship Christ, they honor His sacrifice and atonement by learning about it and implementing it in their daily lives. 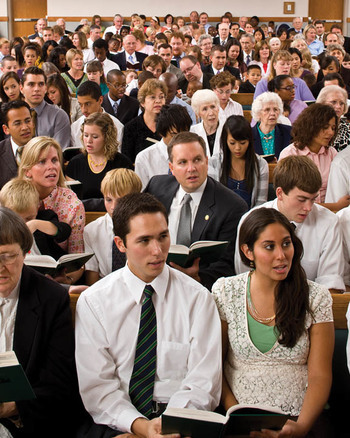 Reverence for God is also manifest in Latter-day Saints’ behavior and demeanor when they enter church buildings or holy temples. Members treat these buildings with respect, particularly the temple, as it is viewed as the house of the Lord. Because of Latter-day Saints’ reverence for God and Jesus Christ, they act with respect when in His holy house. Latter-day Saints believe that the home is also a temple, albeit of a different kind than other temples. Members teach their children reverence in the home, so when they go to church they will know how to act reverently. President Romney instructed Latter-day Saints to have reverence and respect for their homes, and laid responsibility for reverence in the home with parents . This page was last edited on 11 October 2013, at 16:11.